Had Daniel Schumacher (1729-1787) been an ordinary man, we probably would never have heard of him. His bad habits of drinking, swearing, lying, and dancing, amongst others, were not uncommon among the men of his day. But he was a man of the cloth, or better put: One day he hoodwinked Heinrich Melchior Mühlenberg, founder of the Lutheran church in America, with credentials from the Lutheran pastor of New York city and from the ministerium of Lutheran pastors in Hamburg, Germany. Their contents indicated he had studied theology in a German university and was now ready to be ordained. Mühlenberg assigned him “ad interim” to a new Lutheran congregation in Reading, Pennsylvania, and to two neighboring congregations in Alsace and Schwarzwald. Correspondence traveled slowly, and by the time letters had crossed and re-crossed the Atlantic concerning his status, it mattered little that his credentials were false, and that he harbored many bad habits unbecoming to a Lutheran minister. In the interim Schumacher had worked his way into the ministry. The story, of course, might have been different had there been enough ordained preachers willing to circuit ride and preach to the Lutheran settlers on the Frontier, but Daniel was intelligent, talented, and strongly felt his calling as he bravely ministered to those on the edges of civilization. His congregations loved him not only for his bravery, but also for his humanity. They could relate to him, and knew he would understand their foibles and weaknesses. When Mühlenberg sought to dismiss him, Schumacher broke away, built his own church, and took most of the congregation with him. He preached to those who lived among the Blue Mountains in northern Berks and present-day Lehigh Counties, and served approximately 20 congregations in his lifetime. 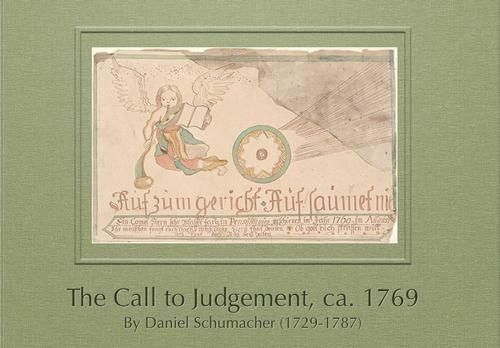 An artist and poet, Daniel Schumacher is one of the few ministers who is also known for his Fraktur—calligraphy and decorative elements such as birds and flowers used by the Pennsylvania Germans to create baptismal certificates, book plates, school rewards, writing samples, etc. Schumacher kept very detailed records of all baptisms, and when he hand drew and colored the Taufscheins (baptismal certificates). 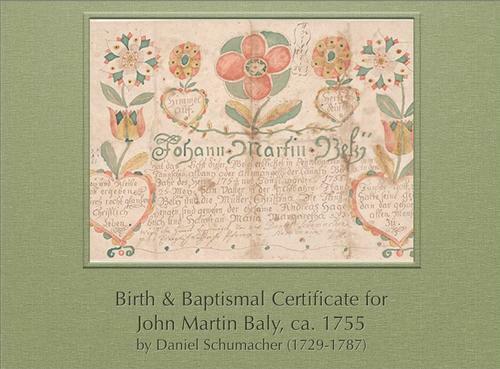 The baptismal certificate for John Martin Baly,1 ca. 1755 (Image 1) is but one example of the approximately 1,700 baptisms he performed. 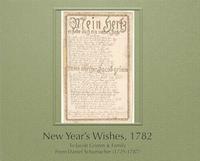 Daniel also made other types of Fraktur such as confirmation and marriage certificates, bookplates, and poems. His poems are varied in theme and content. In August of 1769 a comet appeared in the skies of Pennsylvania, frightening many as a sign of coming destruction. Daniel agreed and created A Call to Judgment (Image 2) to ask sinners not to take chances, and to repent. Could God also be benevolent? 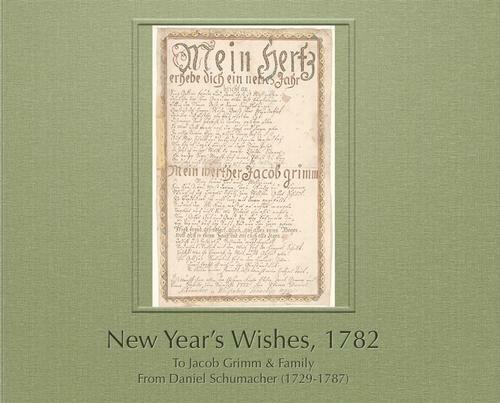 Yes, indeed, and in his New Year’s greetings of 1782 (Image 3) Schumacher embodies a Pennsylvania German tradition of wishing God's blessings on friends and family during the Christmas season. Rejoice my heart for a New Year begins. Sing unto God a joyous hymn for all that which has been good. Give thanks unto Him for all His blessings that you’ve received in the year just past. Ask of Him His blessings in the New for all your needs. For great is His renown, great are His wonders, with which He has dearly preserved you up to now. Harken to this in all your ways my soul that God might further bless and keep you. In all that you do, in all things along your way, step by step, will He crown you a thousand times over. This I take to heart in this New Year, that now within our world another blessing be made to all of Christendom. That I might do my duty, not tire, nor lessen in my resolve. I wish that heaven may preserve his house, and all within—his wife, children, and kin—their good fortune be under God’s protection. May their bread basket n’er be empty, with blessings to overflowing, and may the light of their oil lamp never dim. May it not be for naught, like Peter when he fished so long ago. No! May God’s benevolence and goodwill be ever with you. By day and by night be true unto God only. Peace, joy, health, and happiness be on all your paths. May God be in your house and upon you so that you may remain happy for the whole year. May you accept with joy what God has in store for you. Finally, when you must take leave of the world, may God delight in lifting you up to heaven. Herewith I commend myself unto your favor and love. My heart wishes that you remain my friend. This I wish to all of them, that is to the esteemed church elder Jacob Grimm, and to his family for the New Year 1782.
m.p.p. (by my own hand). 1The Free Library of Philadelphia is home to more than 1,000 Pennsylvania German Fraktur – making this one of the largest public collections of Fraktur in existence. The images that accompany this blog post are part of the FLP collection, available online at http://libwww.freelibrary.org/fraktur/. Thank you for your kind words. I can't think of anything I'd rather be doing than sharing the rich Pennsylvania German heritage in the Henry Stauffer Borneman Pennsylvania German Collection at the Free Library of Philadelphia. That beautiful New Year's prayer is a lovely New Year's gift. I agree. It is a lovely New Year's gift that we can share with others the year through. Thank you for the lovely thoughts of flowers in mid-winter. Fortunately, Daniel Schumacher's flowers on his absolutely gorgeous Fraktur pieces need no watering nor any other care...just admiration! Fascinating entry. Thank you, Del! Thanks, Joe. I know you share my enthusiasm for the many treasures to be found in the Henry Stauffer Borneman Pennsylvania German Collection, one of the finest collections of its kind.